Diabetes In Cats. Conditions associated with feline diabetes, including hypoglycaemia, cystitis, kidney failure or CRF, Chronic Renal Failure, low blood sugar, hypo episode, hypo attack. I have only seen a full blown hypoglycaemic episode once, and it’s probably the most frightening thing I’ve ever seen. Paris hid in the cupboard under the stairs, he was ice cold, utterly still and completely quiet. This is unusual for him as he’s normally very chatty. His head was hanging down and he was staring off into nothingness. He let someone other than me pick him up (unheard of) and he just flopped in Mum’s arms swaying his head backwards and forwards like a rag-doll. He didn’t respond to his name, and seemed to be moving in slow motion. I think it’s one of those things that you’ll recognise if you see it, it’s so different from your cat’s normal behaviour. Get your sugary substance and rub it onto the inside of your cats cheek. You must be careful not to choke your cat, so don’t try and force it down your cat’s throat. You will probably get bitten and there’s gonna be loads of mess, but worry about that later. Just keep going, rubbing more and more into your cat’s cheek until the symptoms subside. I have heard that if your cat is unconscious you can squirt some gel up their bottoms. I’m kinda pleased I’ve not had to try this! As your cat starts to come round, encourage your cat to eat some solid food - it doesn’t matter what it is. Ideally have something to hand that your cat normally goes mad for, and let them eat as much as they want to. Your aim is to give the insulin that caused the hypo attack something to work on. Then, get to your vets so that your cat can be put on a glucose drip if necessary. Obviously, tell your vet what you’ve done so far. I know some brave people don’t go to the vets but carry on administering sugary substances and food at home, it’s your call. If you don’t go to the vets, do give them a call to let them know what has happened. Once the panic is over, try and figure out what caused the attack in the first place. It could be something as simple as your cat throwing up after you’ve given an insulin injection. But a hypoglycaemia attack could be an indication that your cat’s insulin dose is too high for its needs and a glucose curve is probably in order. “We are the company that manufactures and distributes GlucoGel formerly known as Hypostop. We are delighted that you recommend using GlucoGel in treating a hypoglycaemic attack. I just wanted to inform you of the name change of Hypostop. 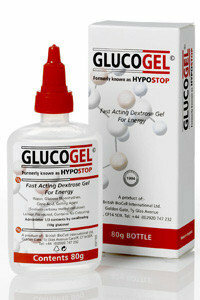 Hypostop is now known as Glucogel. There is no difference in the product just the name is different. There is now a website available and you can visit us and purchase GlucoGel online at www.glucogel.co.uk. We are currently looking to educate more pet owners and Vets on the treatment of hypoglycaemia in cats and dogs. We supply GlucoGel to veterinary surgeries throughout the UK.”. Diabetic neuropathy is thought to be a result of chronic nerve damage caused by high blood sugar levels. It was one of the later symptoms that Paris had when he first became diabetic, after his initial diagnosis and before his diabetes was under control. It manifested as him having weak back legs and walking with more of his legs on the ground than normal. The traditional treatment offered by my vets was steroid injections - and steroids are not good for diabetics. After much surfing on the web I stumbled across Laurie and Jaspers website and we began treating his neuropathy with methylcobalamin - which is the activated form of vitamin B12. Laurie had found an article about how beneficial methylcobalamin had been in humans and she found that her cat Jasper (the big orange goodness!) also benefited from it. There is a link to the article on Laurie’s site, and Jasper is just gorgeous! In my own experience I noticed an improvement in Paris’ legs after about four weeks. Initially I was buying Methylcobalamin from America as I could not find a supplier in England, but now it is much more widely available over here. Just type type "methylcobalamin" into a search engine and you'll get loads of choices. Be warned, it’s not cheap, but it’s likely that you won’t need to be buying it forever, just until your cat’s blood sugars are under control and any neuropathy has subsided. Whatever brand of methylcobalamin you go for, make sure it doesn't contain xylitol. Cystitis in diabetics is caused by the excess sugar in the bladder, and furthermore seems to be relatively common in older female cats. Poor Tatty, as a female, elderly, unregulated diabetic didn’t really stand a chance! She had four bouts of cystitis upon her initial diagnosis as a diabetic in April 2000, and has had three since. It might sounds pretty inconsequential in the scheme of things, but it’s horribly distressing for your cat and it’s dreadfully upsetting to watch your cat suffer with it. Symptoms include frequent squatting and straining on the litter tray (or anywhere for that matter) with little or nothing coming out. The urine may be cloudy, have blood in it or lumps of jelly-like mucous. Many cats including Tatty, cry a lot and are unable to settle anywhere. In a really bad episode your cat may also throw up, or start panting in distress. The common antibiotics we’ve used are Synulox and Marbocyl, normally an injection to start then tablets for five to seven days. And they work - for a while. But as with humans, cats can build up a resistance to antibiotics very quickly. Holland and Barrett used to do a cranberry in liquid form. Tatty used to have three drops per day of their Cranberry Liquid Extract mixed into her food. Unfortunately they don't offer this product any more, but if you're looking for a cranberry liquid extract, I've found something that looks similiar to what Holland and Barrett used to sell on e-bay. Do bear in mind that I have not tried this particular product. If you're after powdered cranberry, Pia in London very kindly wrote to tell me that she had found cranberry powder in her local health food store - and there's a website for people not in London so you can order online. Thanks for writing Pia! American readers might be interested to hear about this website sent to me by Sheila, which sells cranberry extract capsules. Thanks for writing Sheila. When Paris was first diagnosed as diabetic he was already on Hills c/d canned and dry food as he had had FLUTD many years before. Tatty was also on the same food, because she liked it, and it was so much easier to have both cats on the same diet. My vets had told me that the Hills c/d was fine for them both anyway. With diabetes, we made the switch to Hills Hills w/d food mixed half and half with the Hills c/d they were both used to. My cats have always had both the dry biscuits and the tinned varieties - although the tinned stuff seems to be very sticky and I always mix it with hot water to make it easier to eat. The "minced" tinned is a lot more palatable than the original tinned stuff too, according to both my cats. The tinned food is great because you can hide other stuff in it! Upon diagnosis of kidney failure it’s probable that your cat will be switched to a special "kidney" food, designed to be nutritious without over-working the failing kidneys. Such foods will be low in phosphorous and protein. When Paris was first diagnosed with CRF both my cats were switched from Hills w/d and Hills c/d food to Hills k/d formula, which is specially designed for cats with kidney disorders. I know that there are other brands of prescription foods targeted to be beneficial for specific ailments. It doesn’t really matter which prescription food your cat is on, because if you’re dealing with diabetes and kidney failure, the kidneys take priority. Make the transition from the food you’re on now to "kidney food" gradually, and monitor your cat’s diabetes. The change in the calorific value of the food could well lead to your cat needing a different insulin dosage, so be on the lookout for that. Ideally, do home blood tests to determine if the new food means your cat’s insulin requirements have changed. I believe there’s no doubt that the special diet has greatly increased Tatty’s quality and length of life. Her kidney’s have been failing for two years now, and she is still enjoying her retirement. I read somewhere that after cars, the biggest killer of cats is CRF, or kidney failure. And I’m sorry to say that it is fatal, always. That’s not to say that death is imminent, or that there’s nothing that you can do to ensure that your cat remains happy and comfortable for as long as possible. Renal failure seems to go hand in hand with diabetes. Partly, I think because it’s mostly older cats that get both conditions, and partly because a diabetic who is not well regulated will have excess blood sugar which the body has to process, which puts a strain on the kidneys, thus exacerbating their workload. A great guide to kidney failure is Tanya’s site, which is an excellent reference site and used by people all over the world. Tanya’s site is also based in England so medications and treatments are given their English names. Paris was diagnosed with kidney failure in December 2001 and we started him on Fortekor tablets, which had just been approved for feline use at that time. Novartis, the makers of Fortekor, found in their trials that the drug slowed down the progression of the disease, to the extent that some cats lived up to three times longer than cats in the placebo control group. Only it doesn’t seem to work for diabetic cats. I have absolutely no scientific evidence for this, just that for myself and others I know whose diabetics have been put on Fortekor we found there was no improvement in quality or length of life. Paris died almost exactly six months after he started taking Fortekor, which is about what you would expect from a cat that was given no medication at all. Again, I cannot stress how unscientific this is. It’s just in my experience Fortekor appears to be contra-indicated in diabetics. As with any decision to put your cat on a course of drugs, do so only after researching it the best you can and discussing it at length with your vet, taking into account the fact that your cat is also diabetic. You can read Novartis’ own product information here. So far, kidney failure in Tatty has manifested itself as her being a lot more prone to throw up. Kidney failure cats seem to produce a lot more stomach acid, and this acid can make them feel nauseous, especially if they haven’t eaten for a while. Also, you don’t really want your diabetic throwing up, as this upsets your insulin/feeding ratio. Much web surfing came up with Slippery Elm Bark. Slippery elm comes from the inner bark of a deciduous elm tree that is native to North America. The inner bark is tough and flexible with a fibrous texture. It coats the stomach and intestinal tract, soothing and calming. It has a mucilaginous (gelatinous and expansive) quality and is used for all sorts of digestive disorders. It is good for nervous problems, stomach and intestine problems, sore throats and coughs. Some think it may help diabetic conditions. The Chinese noted that it is good for diarrhoea, ulcers, small intestines, nausea and vomiting and for soothing an inflamed colon. Should your diabetic get mouth ulcers, you can use a paste made of Slippery Elm to help sooth and heal. If you know a human who suffers from IBS (Irritable Bowel Syndrome) get them to try it too. Slippery Elm also absorbs toxins in the bowel and soothes the lining of the digestive tract. As an added bonus it’s supposed to be good for your cat’s coat! Tatty gets about one and a half Slippery Elm capsules a day, the powder being mixed into her minced k/d food. I get her tablets from Applejacks The Health Shop in London, and order over the phone. Their number is (0208) 519-5809. Or if you’re in London you will find their shop at 28 The Mall, Stratford, London E15 1XD. They are completely smashing and helpful. This section should actually be called "Mistakes I have made", because although I was treating Tatty for arthritis, it turned out she didn’t have arthritis! And it’s so easily checked I could kick myself. So if you suspect arthritis, a trip to the vets and a quick x-ray is all that’s needed. When looking for an arthritis treatment, I was concerned that a lot of the dietary supplements seemed to contain an awful lot of additives, sugars and flavourings. Not good for a diabetic. A few made mention of the fact that they hadn’t been tested specifically on diabetics. However, my vet suggested we try Cosequin, which seems to be thoroughly tested and doesn’t seem to cause problems with either diabetes or kidney failure. Further, Cosequin also appears to be beneficial to cats with bladder problems, as the lining of the bladder is made of some of the same compounds that are found in joint cartilage. I spent a great deal of time reading through their "Ask A Vet" forum (unfortunately this was closed some time in June 2006) and Cosequin appears to be safe for both diabetics and cats with kidney failure. If Tatty did have arthritis, this is the supplement we would use! UPDATE SEPTEMBER 2006: Helen, who owns an excellent site on cats with kidney failure has written to me “...products containing the same ingredients as Cosequin are known to have raised blood pressure in some human patients. I recommend that anybody using Cosequin for a cat with kidney failure should monitor blood pressure - though anybody with a cat with kidney failure should be doing that anyway.” thanks Helen!